This is The Digital Story Podcast #634, May 8, 2018. Today's theme is "What's Your Online Gallery Strategy?" I'm Derrick Story. If you're like me at all, you have your images spread across various sites online. At one time, you may have had a master plan - best shots go here, family stuff there, everyday life somewhere else. And chances are, as good as that plan was, it went out the door long time ago. So maybe it's time to revisit your portfolio site - a place for only your best shots, the ones that you would show to other photographers and potential clients. Creating such a place these days is easy and very satisfying. And that's the focus of today's show. What's Your Online Gallery Strategy? My original plan wasn't too bad. Instagram for everyday life, Facebook for news and conversation, Smugmug for client galleries, and Flickr for the photography that I wanted to show off. The problem was, however, that Flickr is just so darn versatile. I started using its embed feature to publish photos on other sites, and the next thing I knew, it wasn't my best work. It was just my work. That's fine. But it left me without a true portfolio page. I knew it was time to do something. As I was thinking about this, two other important things happened. First, I was contacted by the folks at Portfoliobox. They asked me if I would take a look at their product. Not long after that, I had a very interesting conversation with an upcoming photographer. I told him he could ask me anything he wanted. His question? "What should I do about an online portfolio?" I don't believe these three events were coincidence. So I decided to investigate the best lead I had: Portfoliobox. More on that in a bit. So why do we need an online portfolio? We need a place where our images look really good - By now everyone knows that Facebook makes your stuff look like crap. Flickr is better, but cluttered as well. When you open a real portfolio, one with paper and pages, the images are presented in the highest quality possible. So it's an opportunity to display our photography as we see it during creation. And we don't have to apologize for the quality. Our portfolio page is dedicated to great photography, and nothing more - Social network sites pull you into to fishing for likes, sharing, and posting everyday. A portfolio page is more like a fine wine that we craft over time. Forget about likes, just put up great images. It's a chance to tell a story - Photo essays can be powerful. But we need to be able to craft those stories without clutter and interference. A portfolio site provides the platform to do so. Custom Domain Name - Nothing fancy here, just www.derrickstoryphotography.com. But using your name or photo business name for your images establishes your credibility when people search for your work. Links to your other sites - Once you've established your creditability as a photographer, then people will look at your other sites in a more favorable light. Put those links on your about page. By way of example, I've begun a portfolio page that you can view - www.derrickstoryphotography.com. I'll be adding to it weekly over the month of May, so together we can watch it grow. As I mentioned earlier in the show, my quest for a gallery page let me to Portfoliobox, based in Stockholm, Sweden, with over 740K users from around the world. Here's what I love about this service. It's easy to use. Without any instruction, I built my first two pages in under an hour. I will be adding a page a week throughout May. "Casio, known today for rather pedestrian point-and-shoot compact cameras, wasn't always that way. In the late 1990s, they were at the forefront of digital imaging, but now, that's no more. A report on Nikkei indicates that the electronics giant will drop its compact cameras and leave the market. A translation of the page pointed to a declining compact camera market as the reason. Indeed that seems to be the case with Casio in the U.S.A. A quick trip to their website doesn't even show cameras under their "products" menu and B&H Photo doesn't list any of their cameras. In the 1990s, it was so weird to frame up an image using an LCD screen. It just wasn't a thing. In fact, this was the first consumer digital camera to offer up a screen for composing and viewing photos, a fact that they even tout in the instruction manual. There was room for 96 images on the camera's built-in memory. The terminology wasn't even invented to describe using this whole process. Casio had to tell people to "think of camera memory like a 96-page album of the images you record," which sounds quaint today. The main way the manual suggested to save your images was to hook up to a TV and record the images onto a video tape." I have some terrific photography titles on both LinkedIn Learning and lynda.com. You may want to visit my lynda.com Author Page or my LinkedIn Learning Author Page. Here's a look at some of the titles waiting for you. Signed Print Giveaway - If you watch one chapter for any of my training videos on lynda.com or LinkedIn Training during the month of May, send me a notification after the viewing via the Contact Form on The Nimble Photographer. (You can sign up for a free trial on lynda.com.) Just say, "I watched a chapter on lynda.com or LinkedIn Learning!" Public registration is now open for the Sonoma Country Hot Air Balloon and Drone Photography Workshop, June 8-10, 2018. We're combining two very fun aerial activities into one workshop. Be sure to get on the Reserve List for this one! This is The Digital Story Podcast #633, May 1, 2018. Today's theme is "Street Photography 2.0." I'm Derrick Story. Many people think of street photography as this stealthy activity that can lead to confrontation if the subject suddenly detects their being the unsuspecting target. But there's another approach, and it's one where the photographer openly integrates with the environment instead of hiding within it. I call this technique Street Photography 2.0, and it's the subject of today's TDS podcast. I think some folks are nervous about street photography because of the way it's often portrayed online. But I think it can actually be a very fulfilling activity. Stephanie Zhu attracting attention in Chinatown, San Francisco. Photo by Derrick Story. It's Not Us vs Them - The idea of going to battle and engaging in confrontation might appeal to some personalities, but that's not the way I do it. Everyone has something to do when in public: going to work, shopping, visiting friends, searching for shelter, etc. Our activity on this given day is to take pictures. We are part of the ecosystem. Know When to Hold Em; Know When to Fold Em - That being said, you have to have your finger on the pulse of the environment you're working in. There are times when you need to keep your gear tucked away and out of sight. And there are some people who you need to stay away from. Be Complementary - When you approach a potential subject, make a note of what you find attractive about them. Is it their wardrobe, an accessory, an attitude? It could be a smile. When your introduce yourself, complement them as well and say that you would like a portrait. That complement will go a long ways toward winning them over. Work Quickly - Have your camera configured for the shot before you approach the subject. Once they give you approval, complete the shoot within 20 seconds. Don't make them regret giving you permission. Be a Man or a Woman of Your Word - If they ask for a copy of the picture, then give them your card, tell them to email you, and you will reply with the photo. Follow through is very important to us maintaining our reputation on the streets. By being genuine, smart, and respectful, you can capture wonderful images on the street without drama and deceit. At the end of the day, you'll like your pictures and yourself as well. In June, we will release a free update (version 1.2) of our flagship software, DxO PhotoLab. Recently awarded the TIPA 2018 Award for Best Image Processing Software, this latest version of DxO PhotoLab will include improved local correction features, and will add support for 7 cameras, including the Canon EOS 2000D and the Sony A7 III. This release will also be an opportunity for us to reiterate our commitment to the "perpetual license" model (as opposed to a subscription model) that allows our customers to update their products according to their needs, rather than in a constrained manner. In June, we will release the new version of the Nik Software Collection, which DxO acquired from Google at the end of 2017. Much awaited by the Nik software community, this first "by DxO" version focuses on fixing bugs that up until now could disrupt the user experience, as well as on ensuring full compatibility with the latest Mac OS and PC platforms. The Keystone correction tool can be found in the Capture One's Lens Correction tab, and it's definitely worth a look. It makes it easy to straighten both vertical and horizontal converging lines - the types of distortion that we often encounter when photographing buildings from ground level. Generally speaking, I use it to correct vertical lines. In this short movie, you can see exactly how it works. Not only does this tool work well, it's not difficult to figure it out. And just like everything else in Capture One Pro, it's non-destructive. So you can go back at any time to readjust the picture. And by using it, you can correct an everyday snapshot (such as the iPhone shot below) into a pretty nice photograph. This video is from my new course titled, Capture One Pro 11 Essential Training on LinkedIn Learning. You can also tune in on lynda.com if you prefer your training there. Either way, I have four hours of entertaining education that will help you master this excellent photo management and editing application. This is The Digital Story Podcast #632, April 24, 2018. Today's theme is "Postcard Gravity." I'm Derrick Story. In my previous life as a cubical worker, we used to have this term for high-flying good ideas that were eventually pulled back to earth to meet their inevitable demise. We called this phenomenon, "corporate gravity." And believe it or not, it has an artistic sibling for photographers that I call that "postcard gravity." And the battle against it is the subject of today's show. Engaging in personal projects is one of the ways we can save our artistic souls as photographers. There are no bosses, committees, focus groups, or editors to shoot down our ideas. We come up with a concept, photograph it, then determine how we feel about its merits. "Fishing, Lahaina" - Kodak ColorPlus 200 film - From the Maui Series by Derrick Story. But sooner or later, even our personal projects find themselves in front of others for their opinions. And how many times have you heard them thinking, "Why can't you just take a pretty picture and leave it at that?" To help you battle Postcard Gravity, I have five techniques that I'm going to share with you right now. Be clear on the concept of the project. Art for art's sake can lead you down some very weird alleys. But if you've thought through your project from start to finish, you have a better opportunity of creating something truly unique, and possible even appealing to the masses. Leverage all of your technical expertise. By combining craftsmanship and artistry, you can impress viewers who might not initially grasp the concept, but appreciate your skill. It's OK to explain what you're doing. You're asking a lot of your audience to perceive in seconds an idea that took you days, or even weeks to perfect. By letting your viewers know something like, "I wanted to create a very graphical look," helps them understand what you're doing. Don't argue with critical feedback. It doesn't do any good. But don't discount positive feedback either. This is especially helpful for a gallery of images. If people express a favorite, then consider showcasing it to promote the entire collection. The main thing is to avoid becoming addicted to sugary likes. Everyone loves a sunset, but generally speaking, that is the artistic work of God, not the photographer. Thomas Hawk Publishes, "My Thoughts on the SmugMug Flickr Acquisition"
"First off, I have to say that I think that the acquisition news is very good for Flickr users and the Flickr community. While time will tell how this acquisition goes, I have much more faith in SmugMug running Flickr than I do Verizon." "In buying Flickr, SmugMug more than anything is buying a community. I think that they are going to be very careful not to disrupt this community and look for ways to grow it thoughtfully. Having known the MacAskills (the family that owns SmugMug) for many years, one thing I can say for certain is that they LOVE photography and photographers. If you ever get a chance to visit their offices in Mountain View, do it. What you will find is wall after wall covered with the biggest prints you have ever seen in your life. These are people who are passionate about photography, not advertising." "For SmugMug, I think what is probably most exciting is that they are getting a very large community of photographers by purchasing Flickr. I think that this will allow them to do even more with community, photowalks, meetups, etc. They will need to make sure Flickr is profitable (and it will be) but they will have a much larger group to build a bigger and stronger community with. While Google+ sort of became a place for the photographic community for a bit, before Google largely abandoned it, there really is not a good place for a larger community of photographers today and I think with the acquisition of Flickr, SmugMug hopes that it can build this and I think they have a pretty good chance at doing it." I think both Thomas and I are excited about this announcement. The Apple Photos Book for Photographers, 2nd Ed is now available on Amazon. If you purchase the book, send me proof, and I'll send you an official book plate that you can print out on a standard 4"x6" sheet of photo paper. This offer is good until April 30, 2018. Use the Contact Form on The Nimble Photographer site. Also, feel free to post a review on Amazon once you've read the book. They're helpful to potential buyers. You could say that it's a crazy hybrid approach to art photography, but it's also convenient with great results. I've been shooting film, having the lab digitize it when it's processed, then printing the images with my inkjet printer using Photos for macOS and Red River Paper card stock. And they look different than anything I've created in the past. "Surfboards, Maui" Scanned version - Contax 159MM, Zeiss 28-70mm, Kodak ColorPlus 200 film. Photo by Derrick Story. The workflow is easy. I shoot the film (which is fun in itself) then send it off to the lab for processing and scanning. I don't get lab prints, just the negatives and the scans. Once everything comes back from the lab, I look at the negatives on a light table. I do this for a couple reasons. First, I can really tell how well I did by looking at the film under the loupe. It's just me, celluloid, and optics. I also check for light leaks and other potential issues that I might need to be aware of with how the camera is working. I then look at the scans. This is the fun part for me, because it's my first viewing of the images in positive format. As with any film project, sometimes I'm happy, sometimes I'm sad. I tend not fiddle around with the images much in post production. I want to retain as much of their raw analog quality as possible. If I do have to touch them up, I can use the editing tools in Photos for macOS, or the Luminar 2018 editing extension. Lots of power with these options, and they keep me in my easy workflow. Then it's time to print. I've been using Red River Paper Matte Card Stock for the output. It's beautiful paper that comes scored, making it easy to fold to 5"x7" finished size. I also purchase my envelopes for the cards at RRP. 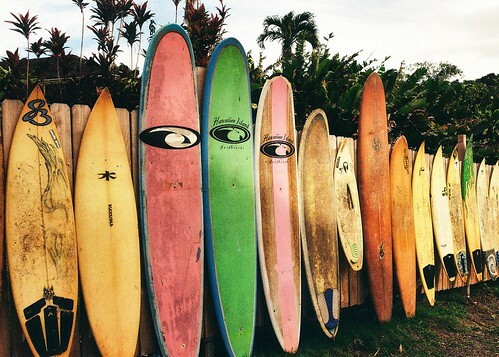 "Surfboards, Maui" Printed version using Red River Paper card stock and Photos for macOS with an inexpensive Canon wireless printer. Image by Derrick Story. In my book, The Apple Photos Book for Photographers, 2nd Edition, I explain how to use the Card tool in Photos to generate your own fine art greeting cards. All of your work is saved as a project in Photos, so you can go back anytime and pick up where you left off, or print more cards. For my printer, I used an inexpensive Canon PIXMA Wireless Photo Printer ($69) that couldn't be easier to operate. As for the final product, these cards look different than anything I've created before. The combination of analog film with modern inkjet technology is truly unique. And the fact that I can manage the entire effort in Photos for macOS keeps it all so very simple. This is The Digital Story Podcast #631, April 17, 2018. Today's theme is "Are There Any Benefits to Watermarking?." I'm Derrick Story. A bad watermark is like pimple on the nose of a beautiful person. You want to enjoy the beauty, but all you can see is the pimple. But not all watermarks are bad. And in fact, they can be both tasteful and useful. And the quest to figure all of that out is the subject of today's TDS podcast. Are There Any Benefits to Watermarking? Watermarking Pros - They are a simple way to identify the creator of the image. Plus, they can be used as branding opportunities. Consider why you're watermarking in the first place. If it's to prevent theft, you very well could be wasting your time. Services like Pixsy do a better job. Also make sure that your copyright information is in the metadata. If you use a signature as your watermark, make sure it's legible. Be careful with brand building watermarks so that don't clutter up the composition and detract from the image. This is especially true if they contains logos. Position the watermark so it creates the least amount of distraction. Put your watermarks on a separate layer so you can control their use, opacity, and appearance. I published an article on TDS on how to do this with Luminar. Public registration is now open for the Sonoma Country Hot Air Balloon and Drone Photography Workshop, June 8-10, 2018. We're combining two very fun aerial activities into one workshop. Sign up today and join us! The Apple Photos Book for Photographers, 2nd Ed is now available on Amazon. Also, feel free to post a review on Amazon once you've read the book. They're helpful to potential buyers. Even though I have the class scheduled for April 21, I'm going to have to move it back until Skylum releases the gold copy of the DAM. If you've already signed up for the class, I will contact you directly about this. If you want to grab one of the few remaining seats, I would go ahead and do that as well. We will run the class as soon as the software is ready. There are many reasons to add (or not to add) a watermark to an image. For most photographers, it's not an everyday activity. But there are times when it's useful for protection or promotion. If you're finishing your photo in Luminar 2018, here's one way to add the watermark. I like this approach because the graphic lives on a separate layer, so you can turn it off, or on, as needed. In this case, I'm going to add my Nimble Photographer logo to an image. But you can use this technique for "FPO" when working on publication layouts, "Proof Only" for wedding work, and other related activities. I usually start with a PNG version because it seems to blend better than Jpegs. In Luminar, I go to Layers, click on the + icon, and choose Add New Image Layer from the popup. Once you have the logo the size you want, position it, then click Done. If you want to change the position later, use Free Transform to move it. You can return as many times as you want with this tool. The image comes in in "Normal" blending mode, showing its white background. But I would prefer a more subtle approach. So I switch to the "Multiply" mode to eliminate the white background. Make sure that the watermark layer is selected, then go to the blending modes popup and survey your options. For this image, the Multiply option worked great. Play with all of the blending modes and choose the one that works best for your particular shot. The finishing touch is choosing the right opacity. For a more subtle approach, I pulled opacity down to 40 percent. By pulling the opacity down to 40 percent, I can create a more subtle rendering of the watermark. Be sure to save your work as a Luminar file - File > Save - So you can return to it another time for a different watermark treatment, or none at all. Then make sure your watermark layer is selected, and export the file - File > Export. Exported file with watermark included. I used 100 percent opacity for this example so you can better see it. But I could easily go back and change the opacity and export again. By having complete control over the appearance and application of the watermark, this allows you to create the right look for purpose at hand. Give it a try and see what you think.